We manufacture all types of Louvres for all types of cars and any other ventilation purpose to specially to suit a customers request. We also have a small range of "Stock Louvres" which we are hoping to increase range and these can be purchased from our online shopping cart, by phone or email etc. 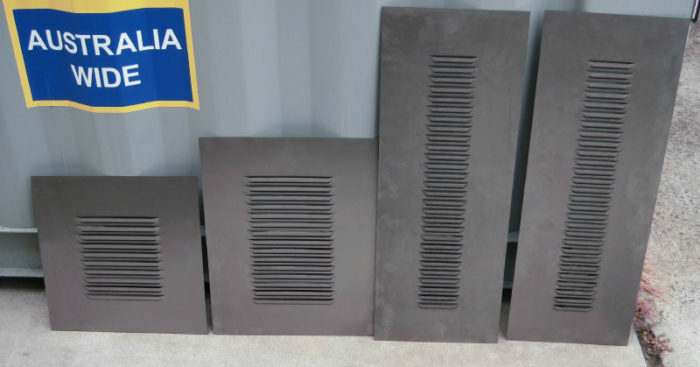 These Stock Louvres can be used for automotive purposes or for other ventilation purposes, such as cooling food vans, caravans, truck trailers or industrial equipment etc. 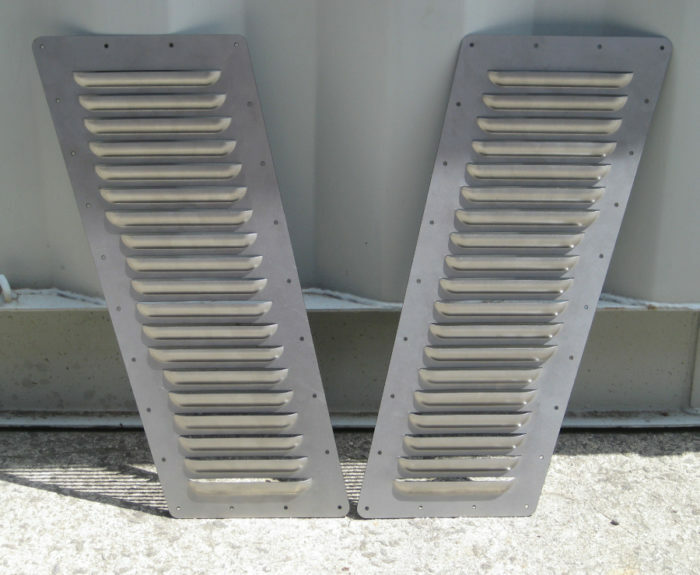 So our louvers can also be used for other general purpose ventilation. All louvers are high quality and look terrific. We have great response from customers about our car louvres. Our louvres can be used for automotive purposes for cooling engines or other ventilation purposes, such as food vans, caravans, cooling of industrial equipment and truck trailers etc. We manufacture louvres from a range of metals such as aluminium, steel and stainless steel. We make double sided louvers and single sided louvers, louvers which face forwards and backwards on the same panel and also triangular shaped louvers. We manufacture different styles of curved profiles and can manufacture louvers with different opening distances. 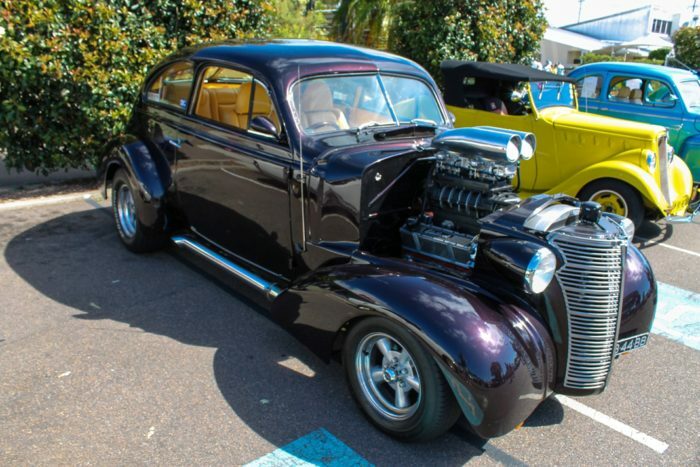 Our louvers will suit motoring enthusiasts who are restoring antique cars and want them to look their best and also people wanting modern car bonnets where louvres can improve a cars appearance. 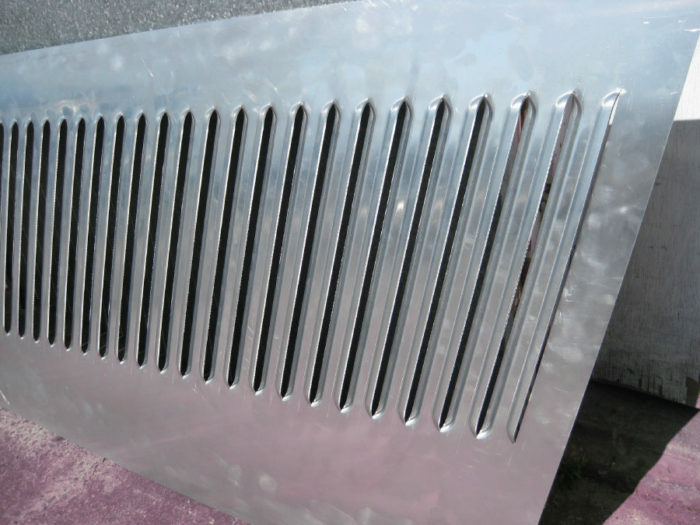 We work in conjunction with supplying many car restoration businesses with our automotive louvers. We now have capacity to press very wide louvre panels up to 2 meters wide and any reasonable length which is now available And we now have the capacity to press whole existing bonnet panels. ****Also NOTE that some ordered louvres may be too big to fit inside next day express post satchels so please allow 3-4 days delivery time by Parcel Post. 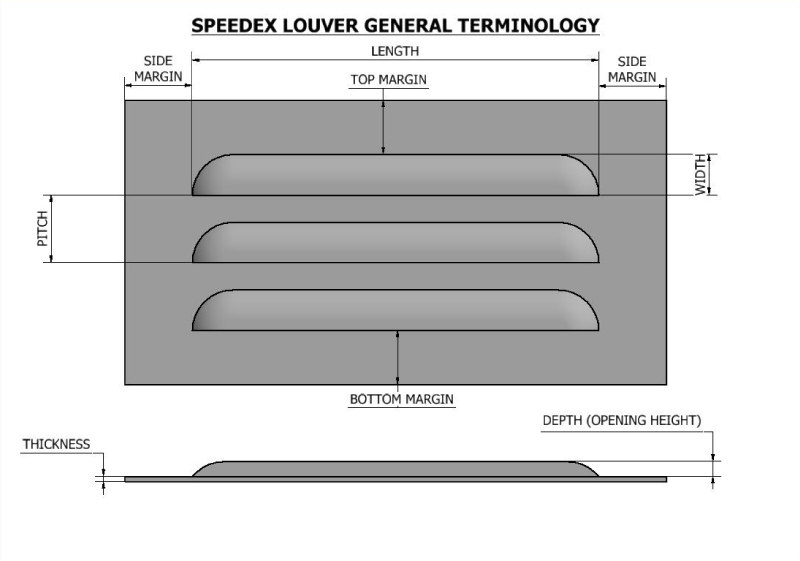 We decided to draw a simple picture above to show customers what our Speedex General Louver Terminology is when describing or specifying a particular louver requirement to us. MARGIN = distance between side of a louvre to perimeter of panel itself. And also between rows of adjacent louvres side by side etc. We have recently decided to standardise louver lengths for particular widths or styles of louvers we can supply, for example our 15mm wide standard louvers range in 10mm increments from 50mm through to 300mm lengths. Other Louver styles or widths range in lengths of 50mm etc. 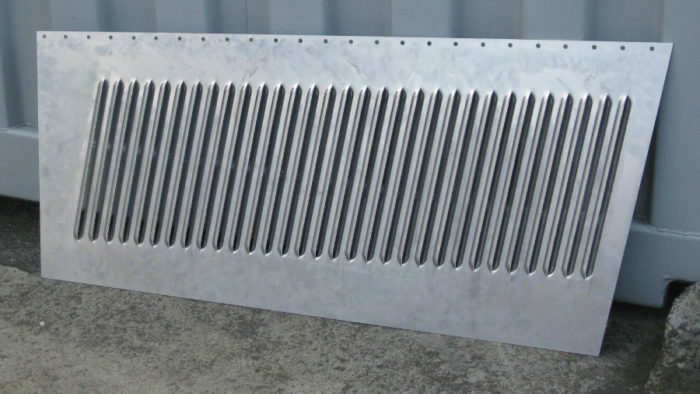 We have recently decided to standardise our louver lengths for particular styles or widths of louvers that we supply. For example our 15mm wide standard louvers will range from 50mm through to 300mm lengths in 10mm increments. Other louver styles will also have several common available lengths. We manufacture a range of standard, stock and custom louver styles and sizes. Please note, we are tool makers and can make any custom louver length as this will require additional tooling and may incure additional costs if non-standard lengths available on the shelf. So we would like to offer a range of common lengths in different styles which should be able to satisfy most of our customer requirements with off the shelf tooling. 3mm wide louvres used for model train louvres and miniture vents. The minimum Pitch or minimum spacing between individual louvers in the 6mm wide standard style is 6mm. We have a range of 12mm wide louvres used in applications where our standard 15mm wide louvres may not be suited due to narrower space available. - 50, 60, 70, 80, 90, 100, 110, 120, 130, 140, 150, 160, 170, 180, 190, 200, 210, 220, 230, 240, 250, 260, 270, 280, 290, 300mm lengths are available in this style. 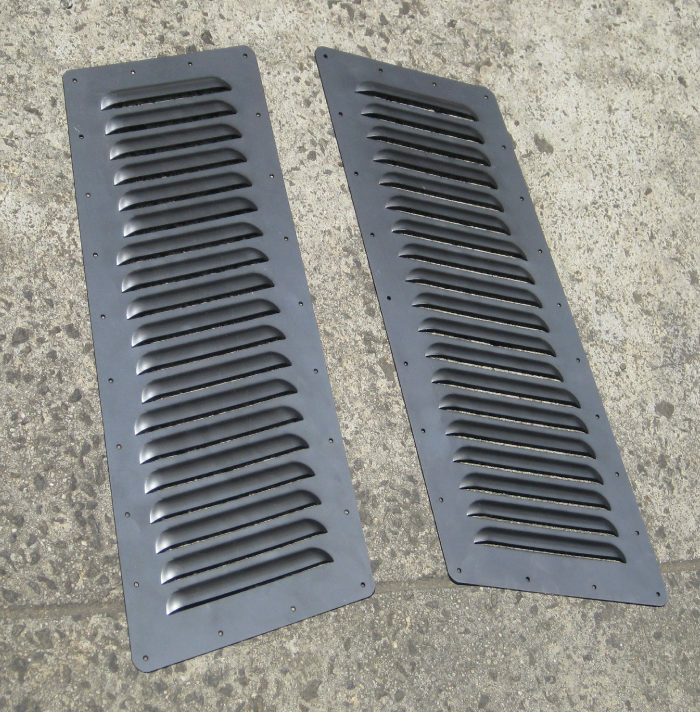 12mm wide louvers have a depth or opening height of 5.5mm approximately. The minimum Pitch or minimum spacing between individual louvers in the 12mm high standard style is 19mm, so they cannot be spaced less than 19mm but can be 19m, 20mm, 21mm, 22mm, 23mm 24mm 25mm etc going up in 1mm increments. This is our most common louver style, which is 15mm wide which we call our "Standard Louver Style"
Standard 15mm wide louvers have a depth or opening height of 5.5mm. The minimum Pitch or minimum spacing between individual louvers in the 15mm wide standard style is 22mm, so they cannot be spaced less than 22mm, but can be spaced any pitch greater or equal to 22, or say 23mm, 24mm, 25mm, 40mm, 50mm, 100mm etc pitch is perfectly fine. Going up in 1mm increments. - 100, 150, 200, 250, 300, 350, 400mm lengths. 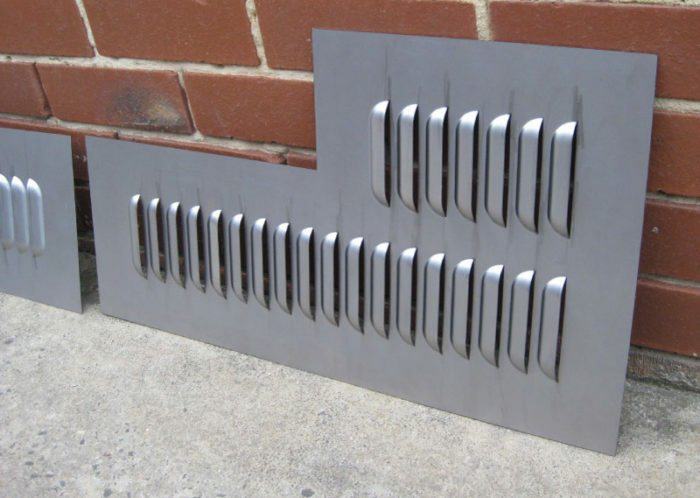 19mm wide louvers have a standard depth or opening height of 9mm. The minimum Pitch or minimum spacing between individual louvers in the 19mm wide style is 28mm, so they cannot be spaced less than 28mm, but can be spaced any pitch equal or greater to 28mm, going up in 1mm increments. 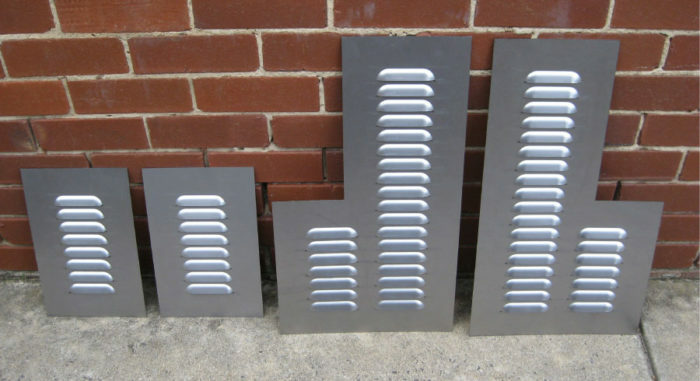 25mm wide louvers have a standard depth or opening height of 10mm standard. 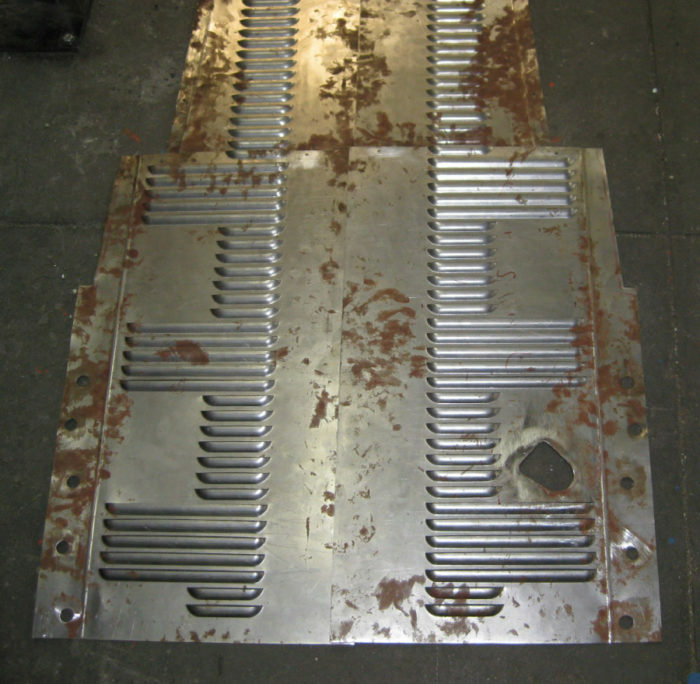 But some older tooling is 24mm wide and 12mm deep, we are hoping to standardise new 25mm wide tooling depths of 10mm. The minimum Pitch or minimum spacing between individual louvers in the 25mm high style is 35mm, so they cannot be spaced less than 35mm, but can be spaced any pitch equal or greater to 35mm, going up in 1mm increments. The above is an example of the 25mm wide louver style. This one above panel individual louvres are actually 24mm wide x 150mm long as we originally intended to make 24mm wide louvres. But please note we have recently standardised this width to 25mm. More louvre sizes and pictures to be updated soon!!! ***PLEASE CHECK OR EMAIL US IF LOUVRE STYLE OR SIZE IS AVAILABLE- THANKYOU! - our online contact form currently has a broken link so please write to us directly from your email address to speedex@speedex.com.au so we recieve it! Can panels have different louver lengths? Can Pitch between individual louvers be equal or different spacing? As long as the spacing is equal or greater than the minimum pitch allowable for each style of louver, then yes any pitch is allowable within reason, usually try to go up in 1mm increment. If you require really precise spacing then we can lasercut panels to be any exact pitch to any decimal place. But generally try to go up in 1mm increments in pitch so we can avoid lasercutting. We can also make different spacing or gaps if specified. As long as you send us a drawing so we can follow. 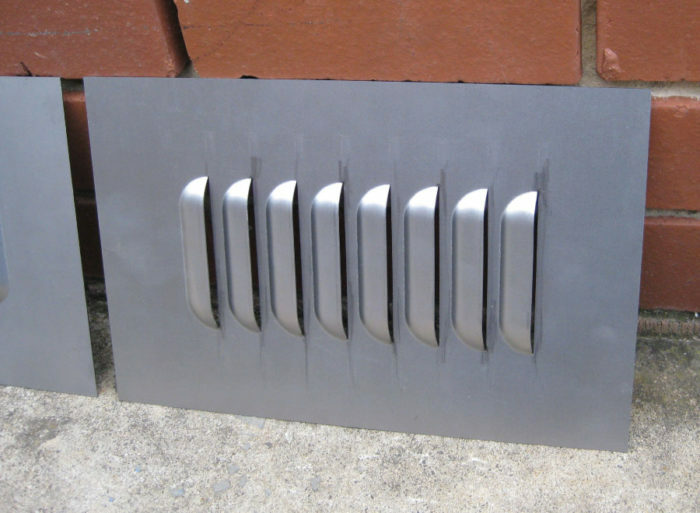 Our louvers are available in aluminium, steel or stainless steel from 0.5mm to 1.5mm thick in Aluminium and say 1mm up to 2mm in steel. If specifiy mild steel we usually make in 1mm thick, but can make in thicker steel if required. Again it is harder to press in thicker steel so we try to aim for 1mm. We usually restrict stainless steel louver panels to 1mm or less as stainless steel is much more difficult to punch and press due to greater tensile strength etc. Is there a minimum margin allowable around pressed louvers? Yes we do have minimum margins allowable around a particular pressed louver and also between adjacent louvers side by side. 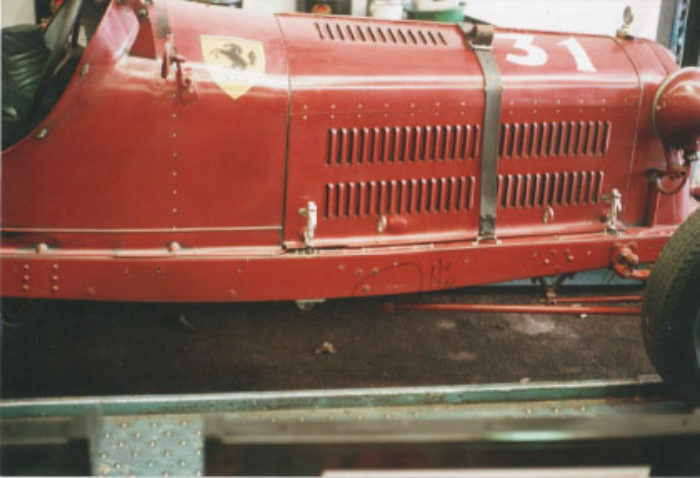 This is due to the fact that if margin is too little the material or panel itself will distort, tear, bend or stretch. We also require a minimum margin "meat" to press the actually steel into shape. ADJACENT or SIDE BY SIDE MARGINS - Please allow a minimum of 25-20mm between louvers spaced side to side, or a minimum gap of 20mm. 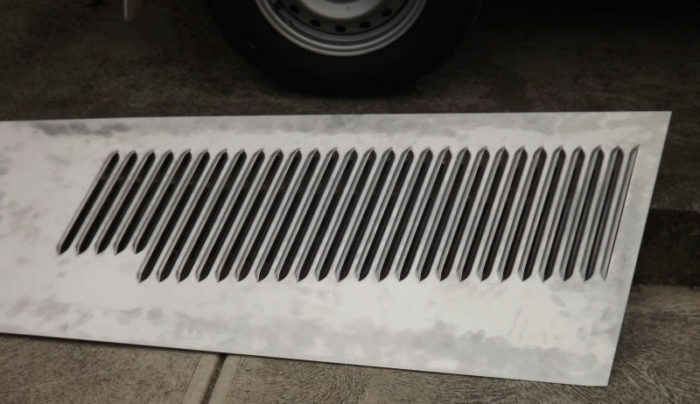 This information above relates to our standrad or most common louvers style of 15mm wide, if louvers are wider such as 24mm or 30mm then margins may have to be increased to prevent material from stretching or tearing. Can we press existing panels or bonnets? We are currently testing our new louver press and new tooling and we should be able to press existing panels and bonnets very soon. What is the maximum panel width that we can do? Our new purpose built louver press can now accept maximum panels widths of 2 meters wide by any length within reason. Can we press bent louvers? Examples on types of louvers we can supply range from these small collection of cars to many more types for automotive and general ventilation purposes. 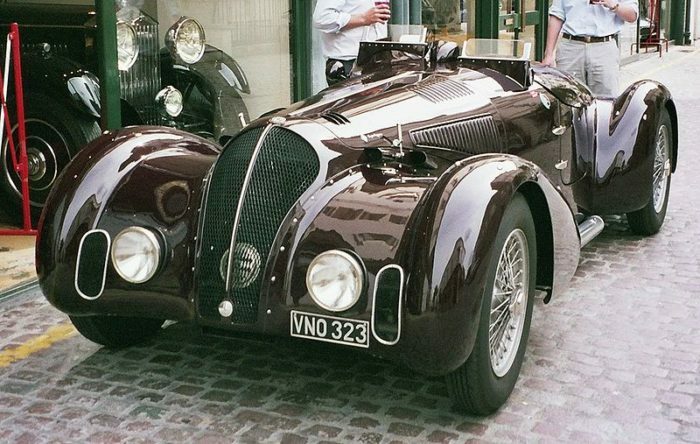 These antique cars (Alfa Romeo's) above and below show a classic example of the types of bonnet louvers that we manufacture. 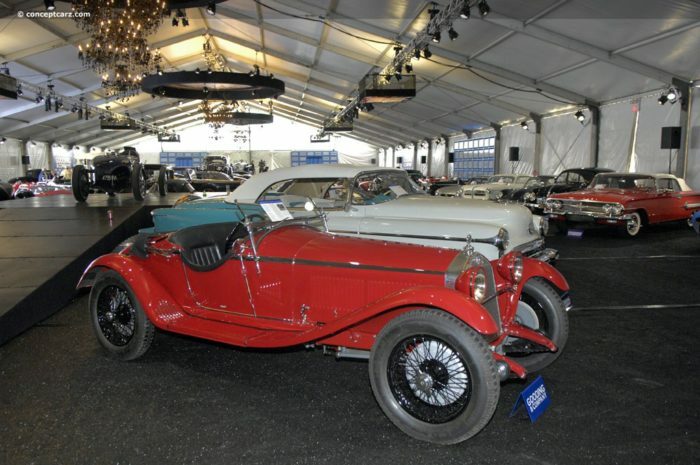 Above is a smaller type of double sided bonnet louver for an antique car. The louvers above are an example of single sided louvers. 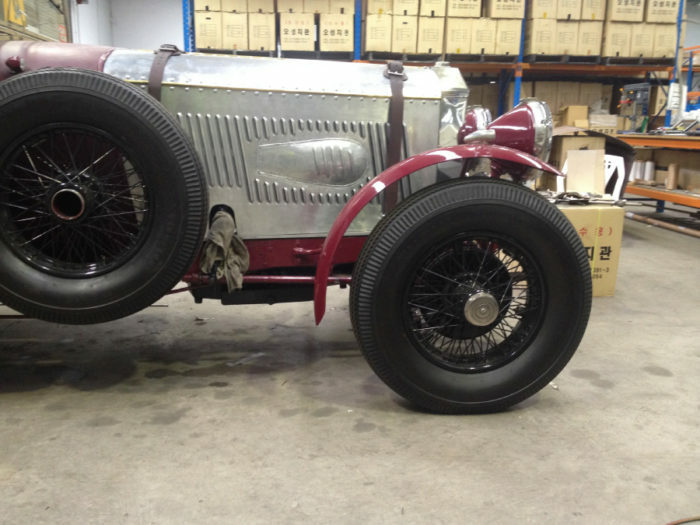 The louvers shown above are for a 1934 Bentley car. They are double sided louvers. 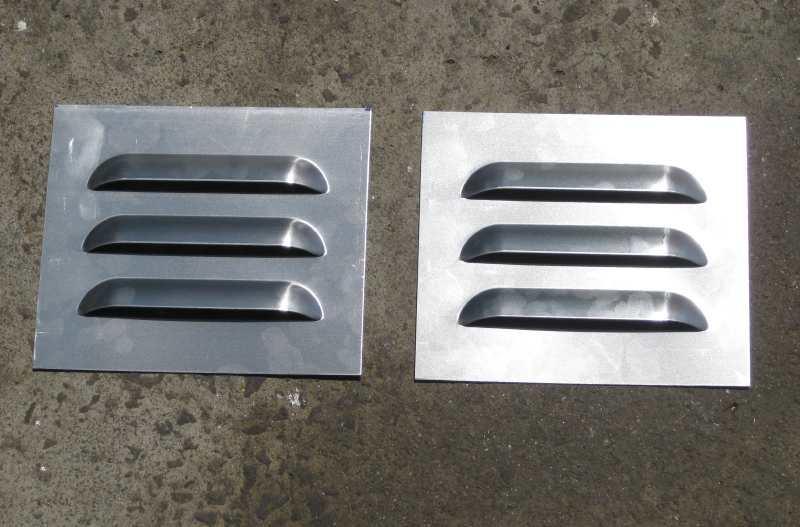 The above photo shows louvers for BMW, single sided, steel, 100mm wide and 200mm wide louvers. 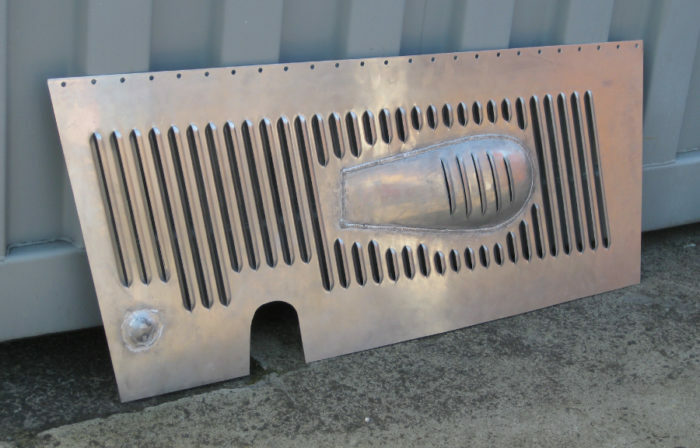 The photos below show louvers we have made for a 1938 Chev hotrod bonnet. These louvers have a unique customized "American" shape to them and have a nice aesthetically pleasing shape to them to compliment cars of this era. 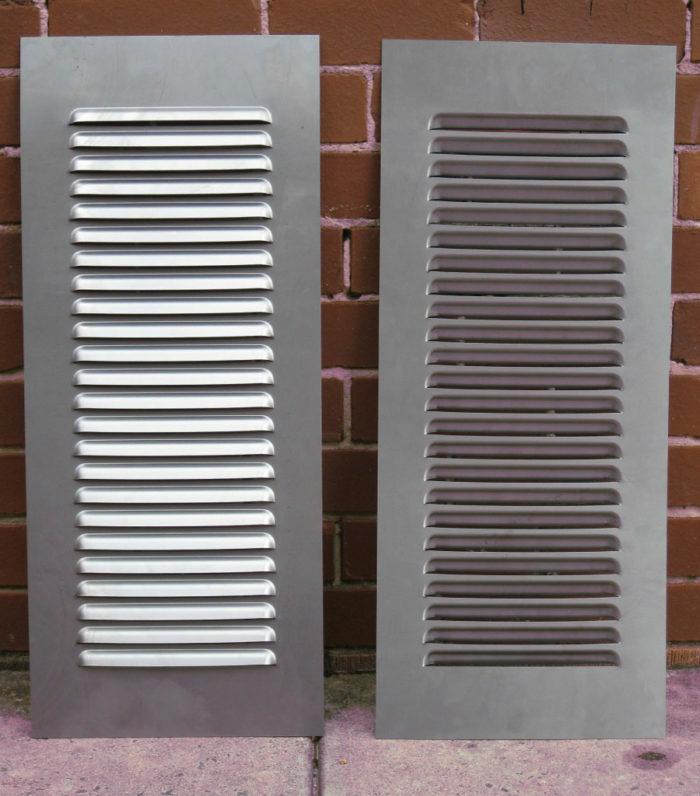 These louvers are single sided, but we can also produce them in double sided depending on customers requests. These particular chev panels shown were made from steel, but we can also supply louver panels in aluminium. The louvers above were fitted in a bonnet of a chev shown below (photos courtesy of Barry Mace). 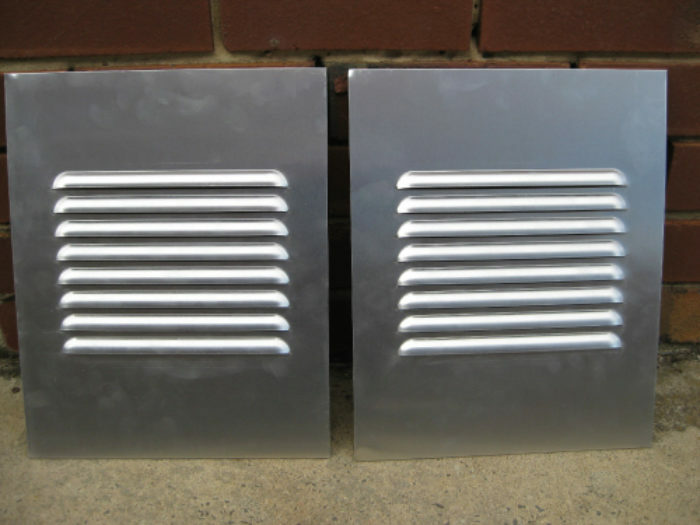 These louvers we made below were for a 1930 Fiat, which we pressed from an existing panel, hence the discolorisation. Notice in the photo below that we offset the same smaller length louvers to follow an interesting curve-like shape. 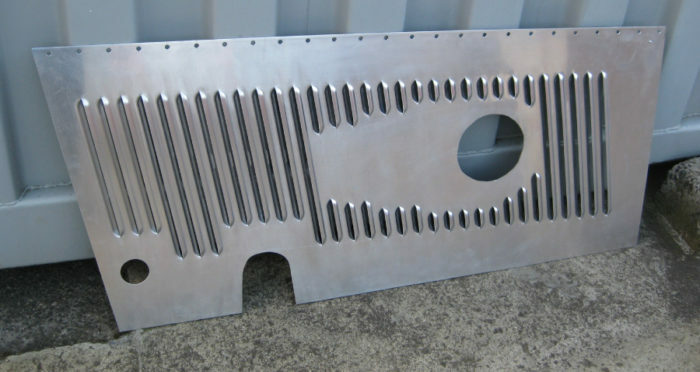 This is the type of louvers that we can make. 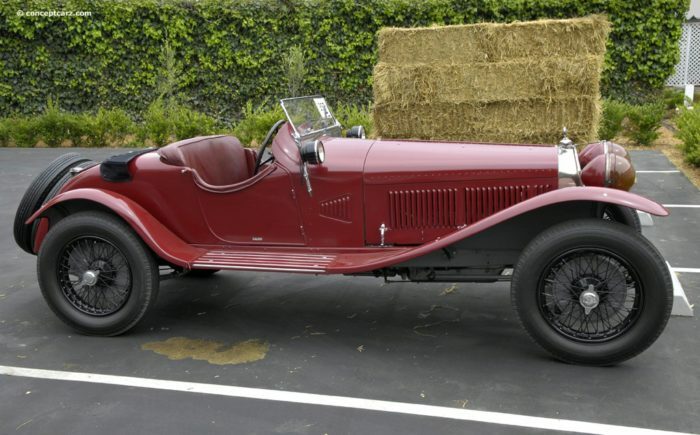 We also supply louvers for Rolls Royce automobiles which have similar shape to our Bentley automotive Louvers. 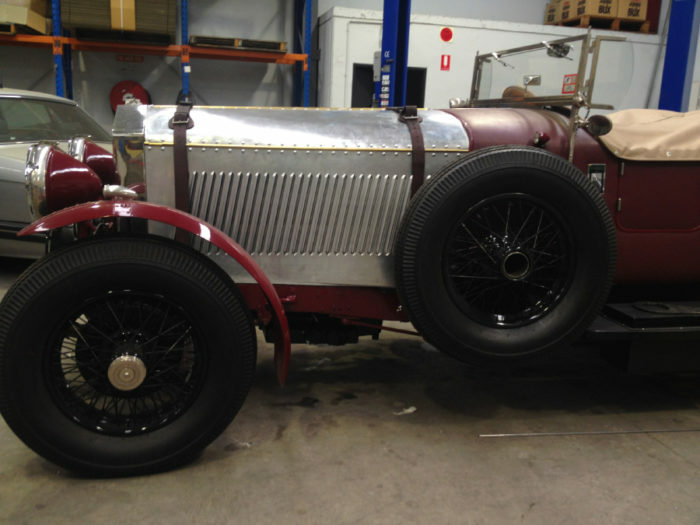 The three louver pictures shown below are for a 1930 Rolls Royce Phantom 1. 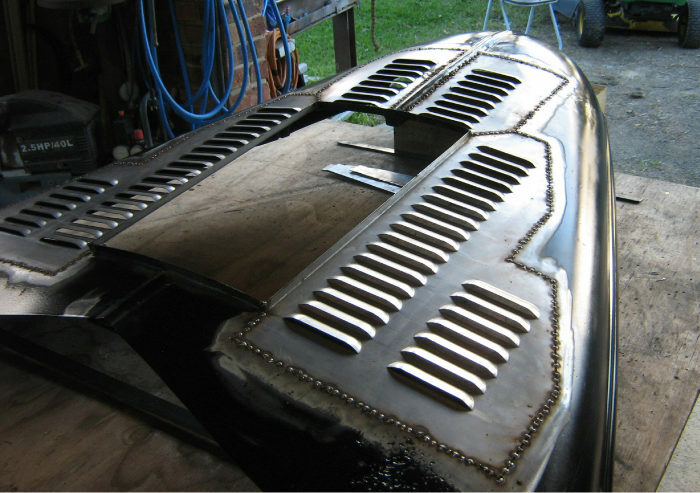 The panel shown above is from a Rolls Royce bonnet. It is shown with no additional panel inserts. 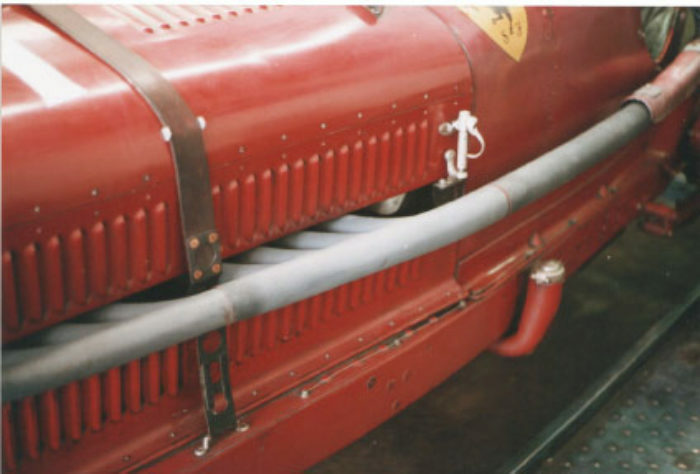 Note that this panel has double sided louvers of many different lengths, in order to flow around certain parts of the cart that prodrude out of the panel. The panel above is the same Rolls Royce louver with an additional domed and a tear drop panels welded into the main panel. 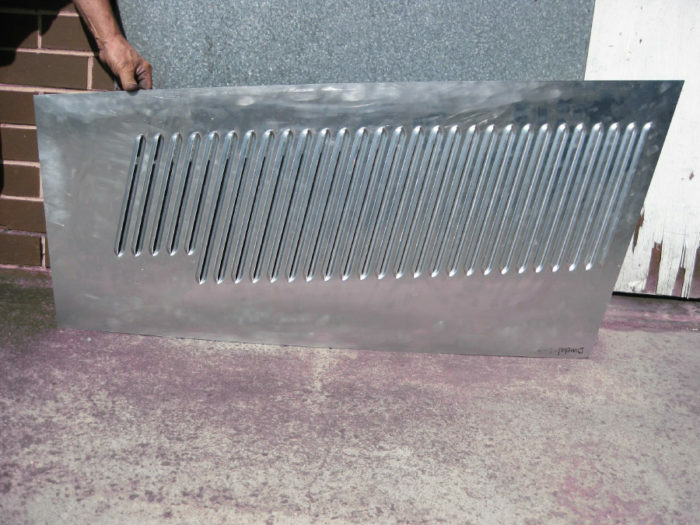 Please note that we have special tooling for pressing in curved shaped louvers of any length in domed shaped panels. The panel above is for the same Rolls Royce cars bonnet but for the opposite side. Please note that all the louvers are full length double sided louvers. The above photo is of the Rolls Royce Phantom 1 with the bonnet louver tied in place for mock up photo. 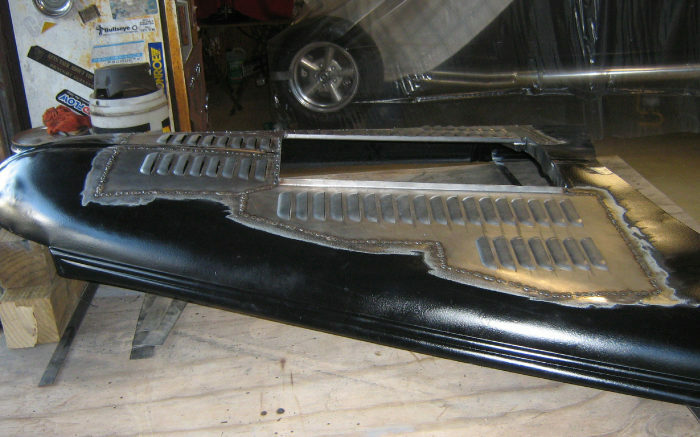 And the photo below is of the same Rolls Royce phantom 1, showing what the other bonnet panel looks like. 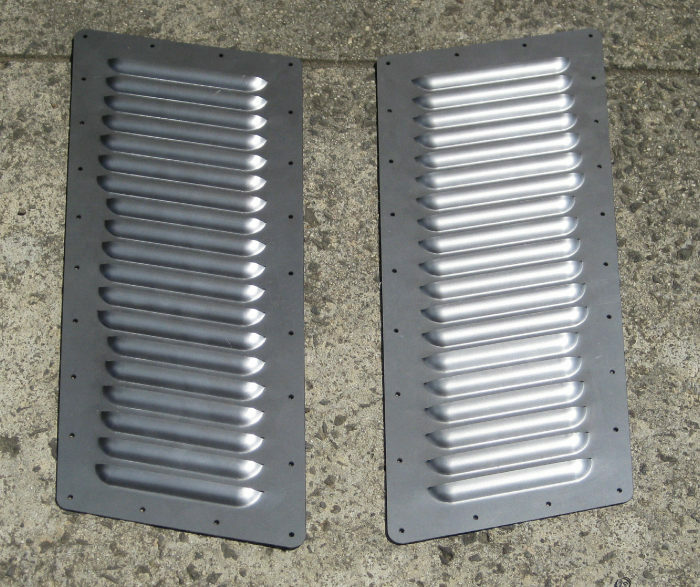 We also manufacture MODERN BONNET LOUVERs, perfect to add extra ventilation to your cars engine bonnet.